We all love Leatherman tools, and here we have some of their best options. But we’ve sought to create a list of the best multi tools with many other top brands. We’ve scoured the internet looking for reviews, trying out different tools, watching videos and carefully choosing the right picks for the list. If you’re looking for a good multi tool for any occasion(think outdoors, everyday carry, to add to your home collection or whatever else you could use it for) then this will be the perfect guide to help you. Perfect for the jack of all trades, the Spirit X Victorinox is a Swiss army knife that can truly do it all. This Swiss army knife is at once sturdy and compact, affording the user easy access to all of his or her tools with a simple reach into the pocket or bag. Known for its durability, this knife is ideal for any application that you can think of and provides you with quick access to a number of helpful tools for around the house or out in the wild. The Spirit X is like having a toolbox in your pocket. It is lightweight yet strong, and with all of the features that it has, you’ll be shocked at how simple it is to tote around when you first pick it up. This knife features 22 functional multi tools and includes items such as wire cutters, screw drivers of different styles, saws, bottle openers, pliers, scissors, clamps, serrated blades and so much more. Each part of the spirit X multi-tool is made out of durable stainless steel that is able to stop the decay or rusting of the knife. It can sit comfortably in the included nylon case or hang around your neck with a lanyard attached. This Swiss army knife measures only 3.25 inches in length and weighs a minimal 5.75 ounces, making it every bit as portable and light as it is useful. 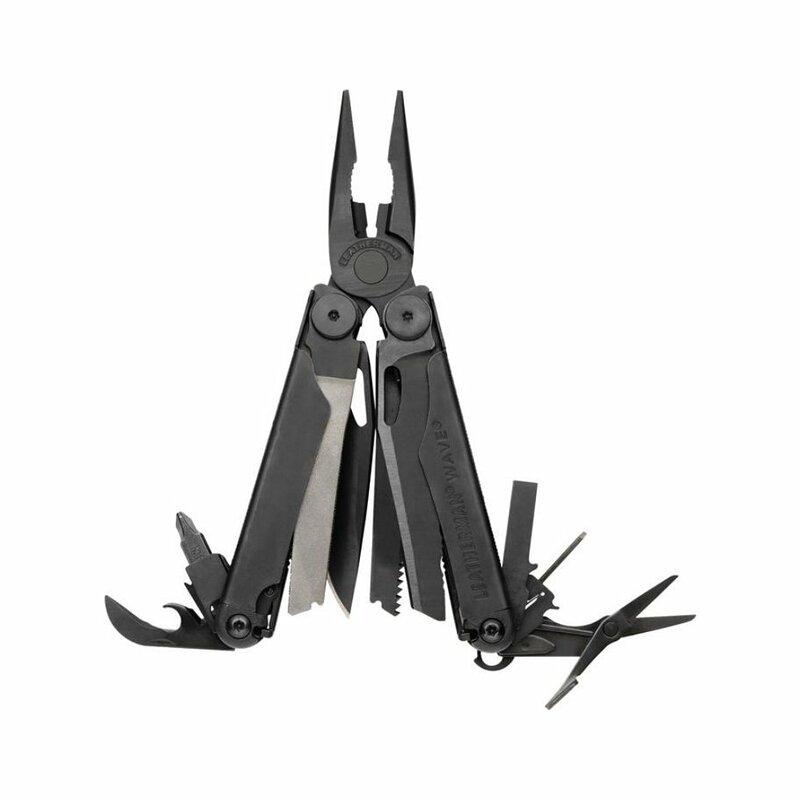 The Leatherman Wave multi tool is a dark, handsome multi tool that functions in just about any way that you might need it to. This tool is able to tackle nearly any sort of job, no matter if you are at home and need a quick fix or are on the job site and want to get something done with efficiency. This tool is practical by design and makes it simple to use with only one hand needed to open each one of the tools. This functionality allows you greater ease of access when your other hand is busy holding pieces together or is otherwise not free. You can open all of the tools one handed, even the ones that are on the inside of the knife instead of the exterior. 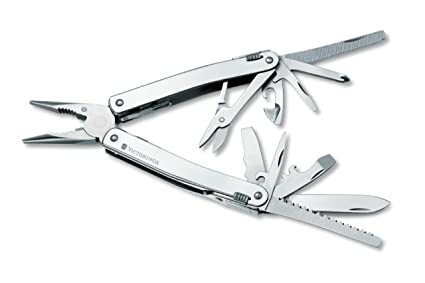 This Multi tool by Leatherman features a variety of tools including knives, wire cutters, locking blades, regular and needlenose pliers, regular and hard wire cutters, saws, serrated and plain knives, wire strippers, ruler, spring action scissors, wood and metal files, bottle and can openers, diamond coated files, large and small bit drivers and medium screwdrivers. Truly, it is a knife that can be used in nearly any application. 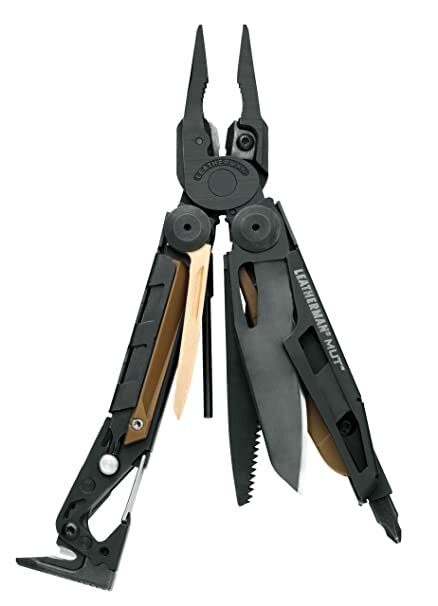 Made from durable metals, the Leatherman Wave has been given a black, attractive finish. This tool is both compact and lightweight, making it ideal for carrying with you anywhere in a pocket or in a bag. Bring all of the functionality of your toolbox wherever you go. With its sleek industrial design and sheer functionality, the Gerber MP600 is a multi tool that is able to handle most any job. It features tools that include the most commonly needed items so that you are always prepared. Black in color, the knife is attractive and handsome, adding a bit of stylish flair that you will love to carry around with you and will be eager to use. 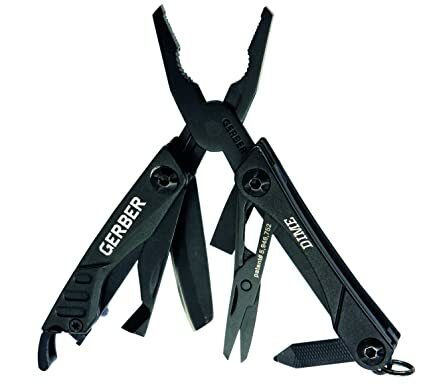 The Gerber multi tool features 14 different fully locking tools in one set, ensuring your safety when you use each one. These tools include but are not limited to: wire cutters, wire strippers, needle nose pliers, screwdrivers of different types, bottle and can openers, cutting tools like a straight and a serrated blade and more. The Gerber MP600 offers one-handed opening that makes using it anywhere simple. This tool set is able to be accessed from anywhere and can be opened with a single hand even when you want to open up the tools that do not sit on the exterior of the Gerber multi tool . Its black oxide-coated stainless steel handle resists any sort of rust and tarnish to ensure a knife that always looks new and lightly used. It comes with a ballistic nylon sheath for it to sit in while not in use. Traveling with the MP600 is effortless thanks to the lightweight and compact nature that it features. Keep it at home for around the house jobs or take it to work. An excellent tool that any handyman should always have on his person. This tool is durably built and ideal for both jobs at home and jobs on the go or at work, making it a sleek and slender multi tool that can go wherever you go. The Powerassist Multi Tool is built out of 420 stainless steel to ensure that rusting or tarnishing will not be a problem with this tool. The tools inside total up to 16 different types to use for nearly any task that comes along. It comes with items such as a pair of pliers, a serrated blade, a smooth blade, a bottle opener, a file, two types of screwdrivers and so much more. The SOG Powerassist Multi Tool features SOG’s patented Compound Leverage that allows you to grip onto the knife more tightly, in turn applying more pressure to the tool you are using in order to perform the job more swiftly. This can save you time cutting, sawing and filing no matter what task you are working on. This tool offers a PowerAssist function that makes using the SOG Powerassist Multi Tool even simpler. The functionality means that you can open the knife up with ease, and it is especially useful for opening up the two different blades. This allows you to multitask with the other hand at the same time or prepare the item that you need to tend to while you open up the tool. Even with all of these versatile tool options, the multi tool is still lightweight and durable. The Gerber Diesel is perfect for the handyman who considers himself to be a jack of all trades. This multi tool offers incredible functionality in a stylish way, one that gives a modern upgrade to tools of the past. Just like carrying around the most used tools in your toolbox, the Gerber multi tool features 15 different tools for you to take advantage of. These include but are not limited to a pair of scissors, a straight blade, a serrated blade, a file, a bottle opener, a pair of pliers and more. The Gerber Diesel multi tool is strong and durable, able to outlast the weather and able to withstand the test of time. This mult itool is made from stable, sturdy metals that won’t experience anything other than general wear and tear in terms of damage. This tool is able to be operated using only a single hand. You can gain access to any of the tools, not just the ones that are on the outside and easily accessed. This frees up your other hand for multitasking use or preparing the item that you intend to use one of the tools on. Made with reliable industrial-strength materials, this knife is one that is going to be able to outlast years of usage. Heavy duty and tough, it can easily withstand the elements and become a part of your daily routine. Use it at home, while on the go or while at work so that you can always be prepared. Designed to look like a stripped down version of your favorite multitool with all of the gears exposed, the Leatherman Skeletool is a neat and useful tool that is appropriate for use at home or when out and about. This multitool comes with seven different tools for you to take advantage of and makes this knife ideal for use while out camping or exploring. 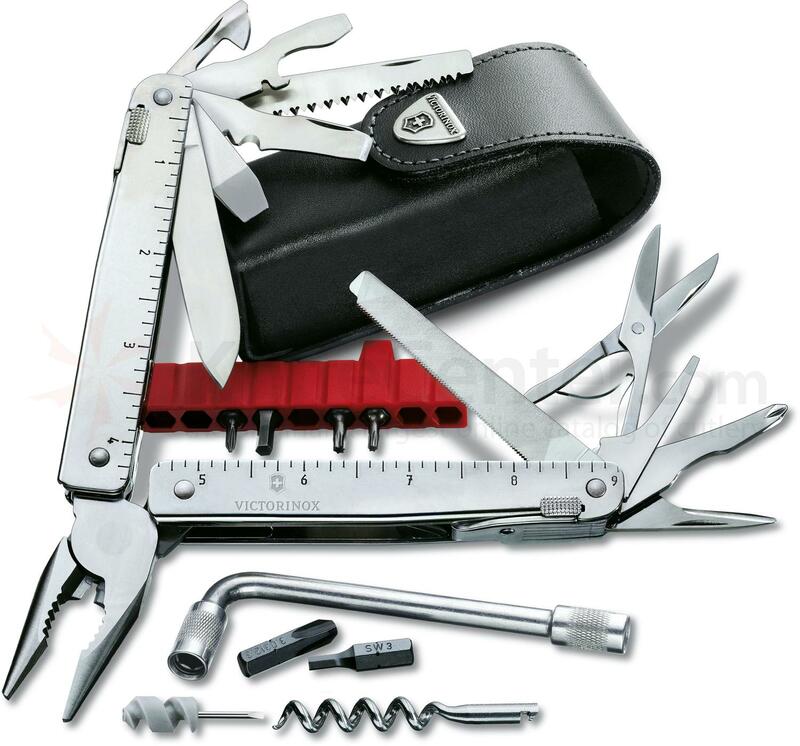 The tools include needle nose pliers, regular pliers, 420HC combo knife, wire cutters, hard wire cutters, large bit driver and bottle opener that also serves as a carabiner. The tools come with a locking blade that will stay in place when it is fully deployed in order to ensure your safety. This Leatherman Multi tool has been designed to allow you to access the tools, no matter if the multitool is opened or closed. This helps to mirror the functionality of a pocket knife while delivering far more convenience and usefulness than a pocket knife ever could. The tool allows you to operate it with one hand, making it ideal for use while multitasking with the other hand for more efficient work to be completed. This goes for every single feature on the multi tool. With its durable build and lightweight nature, the Skeletool can go along with you anywhere you need it to go. This tool is also unique with its skeleton design, making for a tool that is every bit as useful as it is visually appealing. The Gerber Multi Plier is one of the sleekest and most stylish multitools that you could most likely ever get your hands on. This is a multi-plier that offers a number of different components to meet all of your plier needs in one convenient, efficient way. Made from durable and resilient stainless steel, the Gerber Multi Plier is a suspension tool that makes it easier to get your work done with the right amount of pressure applied in every squeeze. This tool offers 12 integrated components that make it totally versatile; it can tackle any job, from home repair and home improvement to applications out on the job site where you work. It comes with a Saf.T.Plus component that serves as a locking mechanism so that when the tool is open, you can use the tools more efficiently, effectively and, most importantly, without risk of injury. It is ultra lightweight and can therefore easily be taken along with you in your pocket. The tool is supplied with its own ballistic nylon sheath to store it in. The sheath ensures protection when you carry it around with you and can easily tote the tool from place to place. The Gerber Multi Plier is made out of stainless steel which promises to resist any sort of rust or corrosion. This tool is not bulky in the slightest and is able to fit into the hand easily thanks to the comfortable curves of the handles. This ensures total support and comfort while you are in control of the pliers. The Gerber Dime multitool is your all in one tool, perfect for assisting professional handymen to the casual tinkerer alike. 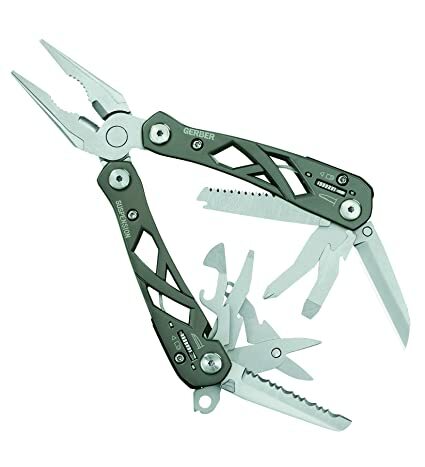 This multi tool boasts a durable stainless steel construction that makes it resistant to any sort of rust or corrosion. It is incredibly lightweight and will not weigh down your pocket, also ensuring to be a comfortable fit in your hand. This instrument is compact as well, able to fit into the pocket or any camping or tool bag with ease to provide you with all of the convenience of a full toolbox or tool kit with none of the bulk and the weight. Its size measures out to be only 4.25 inches in length when the Dime multitool is closed, making it simple tote around with you absolutely anywhere, whether that means from job to job or out in the woods. 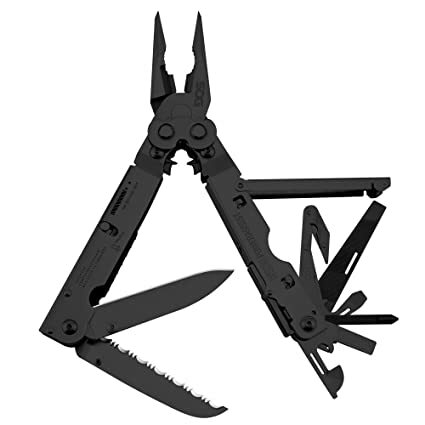 The Gerber Dime multi tool features 10 different tools. These include a file, tweezers, bottle opener, crosshead driver, medium flat driver, pair of scissors, retail package opener, fine edge blade, wire cutters, and needle nose spring-loaded pliers. These tools can be used for a wide variety of applications and will make you the person that everyone turns to for a quick bit of help. These Gerber Dime multi tools are convenient and easy to access thanks to their butterfly opening mechanism. This mechanism exposes all of the tools at one time so that you can have your pick and begin using it in no time. The Leatherman Mut is a tool that is designed for use anywhere that you might need to perform a little bit of handiwork. Made with durable stainless steel, the Mut multi tool comes with everything that you could need to perform jobs both large and small. Whether you are working on a home improvement or repair project or need to get something done in a flash at the job site, this Leatherman multi tool can help. 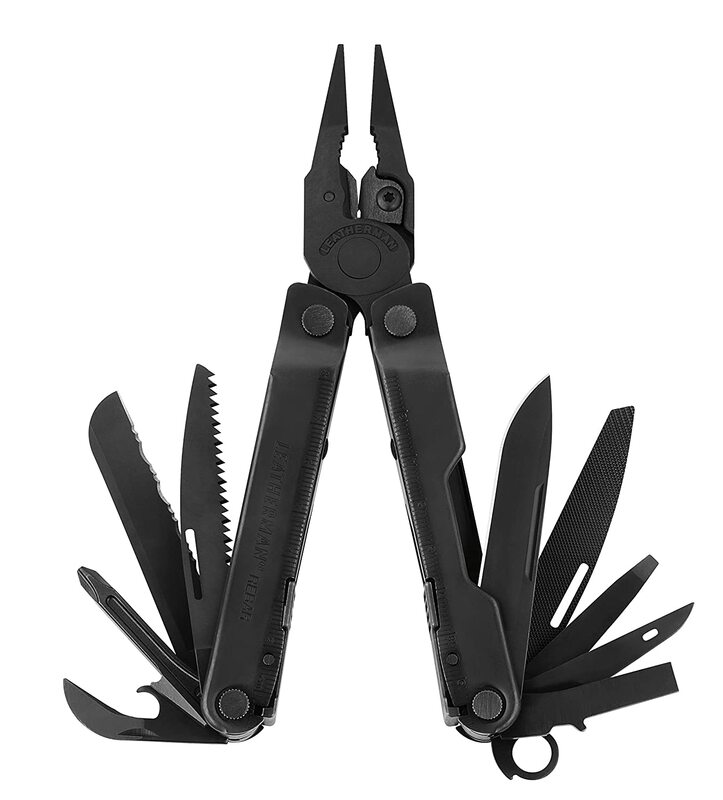 With the Leatherman Mut multi tool, you are getting 16 different tools: regular pliers, stranded-wire cutters, needle nose pliers, electrical crimper, 420HC combo knife, hammer, 154CM replaceable wire cutters, bolt override tool, 154CM replaceable hard-wire cutters, replaceable bronze carbon scraper, #8-32 cleaning rod and brush adapter, replaceable firearm disassembly punch, carabiner/bottle opener, large bit driver, saw, and a replaceable cutting hook. 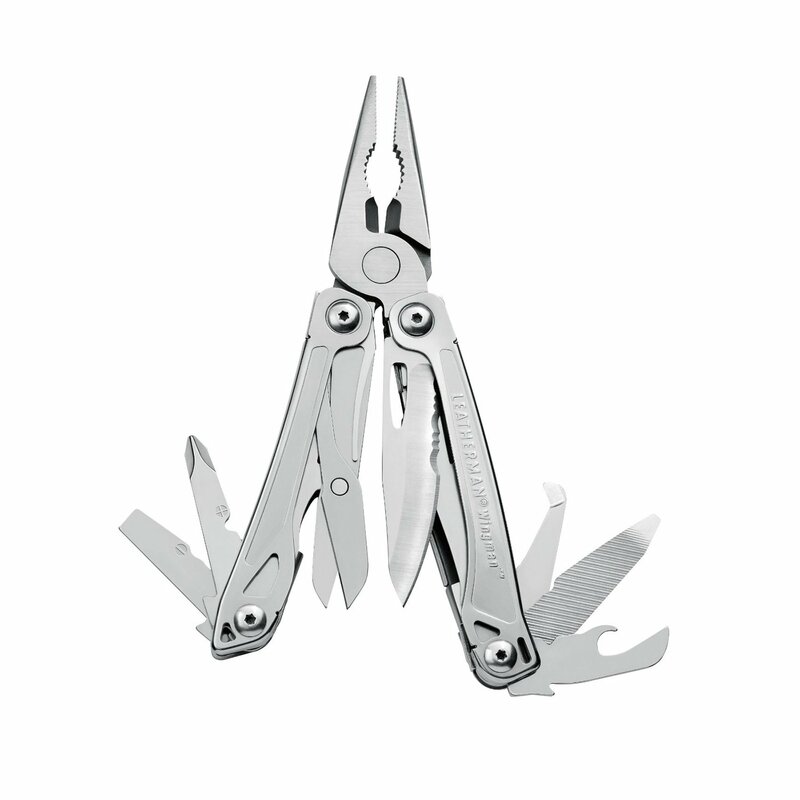 This Leatherman multi tool is totally able to be used with one hand, freeing up the other hand for multitasking. The tool can be opened and operated with the movement of one hand, no matter if the tool is an internal or external one. The tools store away inside of the lightweight handle which makes it easy to keep them organized and easy to locate when you need them. It comes with a removable, replaceable pocket clip as well. This pocket clip gives you many carrying options that will make it easy to clip it either onto your pocket or your belt, or toss it into a bag or pocket. Perfect for any self-proclaimed handyman, jack of all trades or even professionals, the Victorinox Swiss Tool Swiss Army Knife is your key to simplified problem solving, no matter what you are doing. This tool can help with home projects like renovations and repairs, or it can be toted along with you to work on the job. This tool is also an ideal tool for taking along with you on outdoor adventures such as camping or hunting. The Victorinox Swiss Tool Swiss Army Knife comes with 37 functions for you to choose from to ensure that no job is left undone. The tools that come with this unit include but are not limited to large and small bit drillers, corkscrews, a pair of scissors, a bottle opener, a can opener, a pair of pliers, a file, a smooth-bladed knife, a serrated-edge knife and so much more. When this tool is opened up all of the way, it offers a ruler that goes up to 9 inches to help you measure out important items. This cool Swiss Army Knife is ultra compact, sturdy and measures only 4 inches high and 6 inches wide to ensure that it can be carried in any pocket or bag with the utmost of ease. Made from stainless steel, you will never have to worry about it rusting or tarnishing. A genuine Swiss army knife, the Victorinox is made in Switzerland. The Leatherman Rebar comes with everything that you could need to get the job done at work, at home or while out in the woods. It is rugged and durable as it is made from ultra strong metal, able to go with you wherever the work needs to be done. This Leatherman Rebar multi tool is like having a full toolbox with you at all times but with none of the bulk and all of the convenience. This durable multi tool comes with 17 different tools that can be used for a variety of applications. This includes tools such as regular pliers, needle nose pliers, 154 CM replaceable wire cutters, 154 CM replaceable hard wire cutters, electrical crimper, wire stripper, 420 HC serrated knife, 420 HC knife, awl with threaded loop, saw, ruler that measures up to 8 inches or 19 centimeters, bottle opener, can opener, a wood and metal file, small and large screwdrivers and a Phillips head screwdriver. Each one of the aforementioned tools in the Leatherman Rebar multi tool comes with a stable locking mechanism. This locking mechanism is designed to allow you to operate each part of the durable multi tool efficiently and safely. You can lock them into place and put pressure onto the tool while using it before you manually close it back. The lanyard ring makes it simple to attach the tool to any lanyard for easy carrying, but it is also compact enough that you could also throw it into your pocket. The Leatherman Wingman multi-tool comes with 14 impressive tools that can keep you working on projects large and small, no matter what tools they might require. The tools that are included in this set are spring action needle nose pliers, spring action wire cutters, spring action regular pliers, a ruler that measures 1.5 inches or 3.8 centimeters, a pair of spring action scissors, 420HC combo knife, a wire stripper, a package opener, a bottle opener, a can opener, a wood and metal file, a small screwdriver, medium screw driver and a Phillips head screw driver as well. You can get all of the power of a full sized toolbox in a small and compact way that offers exponentially more convenience. The blades that come with the Leatherman Wingman multitool lock into place in order to provide a safe user experience. The knife will lock back up when you fold it into itself again as a way to add convenience and further the safety measures. You can also safely open up each of the tools on the Wingman multi-tool with one hand, making sure that the tools are always accessible, even if one of your hands is busy doing something else at the time so that you can multi task with ease. The Wingman l is not only durable and resilient by composition, it is also lightweight and compact. This makes it ideal for storing away the multi-tool in your pocket for use on the go. 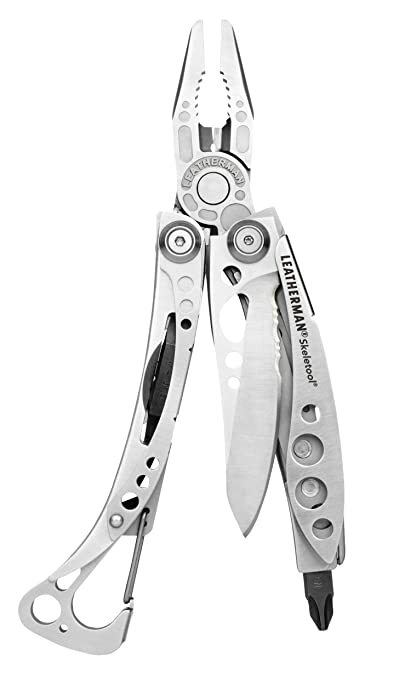 The Leatherman – Wave Multitool, Stainless Steel with Leather Sheath is a tool that will have you ready for absolutely anything life throws at you, whether you are stuck inside of your home weathering a storm, out in the wild surviving a camping or hiking trip or simply around the house working on a few projects here and there. With its size, it affords longer, sturdier tools that can tackle any sort of job, no matter what you need to do. Each piece of the tool locks into place when you need to use it in order to ensure a sturdy and safe functionality while also closing up with ease when you are done using it to transform back into a standard, slender and easy-to-pocket shape. Many pocket knives have often been deemed “swiss army knives,” but they aren’t. Just because a knife is compact and helpful doesn’t mean that it is an authentic Swiss Army knife. If you have ever wanted to own a Swiss Army Knife, now is your chance. The Victorinox Swiss Army Pioneer Alox 93mm Medium Pocket Knife is a limited edition, genuine Swiss Army knife that is made by Victorinox. This Swiss Army Knife is cast in the traditional military olive green color, allowing you an authentic feel that you won’t get with a standard silver toned or black knife. It features high-grade alox scales to add even more detail. Purchasing a knife shouldn’t be a whimsical decision; you need a knife that can stand up to the test again and again and not a flimsy knife that will only last you a few uses. Whatever you have for a new knife, you will find the perfect choice in the SOG Specialty Knives Trident Assisted Folding Knife TF1-CP. This knife features SOG Assisted Technology that helps you to open the blade with one hand, allowing you to work more efficiently than ever before.